RamaKrishna rao was born at Burgula Village of Kalvakurty Taluq in Mahaboobnagar district on 13 March 1899. The name of his village later on became his family name. He studied B.A. at Fergueson college of Pune and later on earned a degree in Law in Mumbai. He practiced law in Hyderabad and had became quite famous in a short time. He was proficient in Telugu, English, Sanskrit, Maratha, Urdu and Persian languages. He had written two books in Telugu, namely – ‘Krishnasatakam’ and ‘Saraswatha vyasa muktavali’. Burgula was influenced by the National Movement even while he was a student. He played an active role in establishing the ‘Youngmen’s Association of Hyderabad’. He became a member of the ‘Andhra Central Janasangham’ in 1921. He worked hard for the development of Sri Krishnadevaraya – Andhra Bhasha Nilayam as an executive member. The Andhra Janasangham had become the Andhra Mahasabha in 1930 in order to work more efficiently for the social, cultural and political development of Telangana. Burgula presided over the second conference of the Andhra Mahasabha at DevaraKonda in 1931. 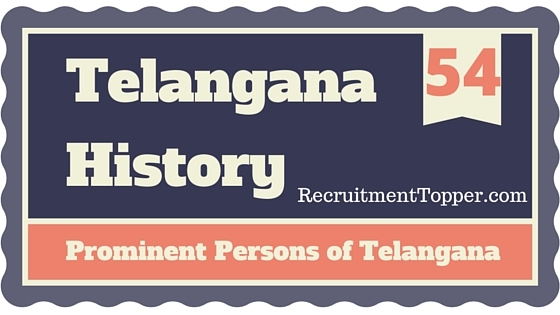 He gave speeches against the Nizam Government between 1942-47 and was arrested. He played an active part in the Join India’ movement’ in 1947 and was arrested. After the ‘Police action’ in Hyderabad state, Burgula worked as the minister of Revenue, Education and Excise in the M.K. Vellodi ministry. After the gen¬eral elections of 1952, he became the first pop¬ular chief minister of Hyderabad state. After the formation of Andhra pradesh, Burgula worked as the Governor of Kerala from 1957 to 1960 and the Governor of U.P. from 1960 to 1962 and as a member of Rajyasabha from 1962 to 1966. He died on 15 September, 1967 at Hyderabad. Ramananda Tirtha was born at Sindgi Village of Gulbarga district in October 1903. His name was Venkatarao Khedgekar. At his 28th year, he had taken up ‘Sanyasa’ or monkhood and had become Swami Ramananda Tirtha. He was proficient in Marathi, Telugu, Kannada, Sanskrit, Hindi and English languages. He took an oath in 1920 to remain a bachelor for life and serve his country. He took his post graduate degree in M.A. He was influenced by the ideals of Gandhiji very much. He published a weekly magazine called ‘Vision’. He went to jail several times during the National movement – in 1941 during the individual satyagraha and during Quit India movement in 1942. Ramananda Tirtha was the main force behind the formation of the Hyderabad State Congress in 1938, which fought against the autocratic rule of Nizam. This organisation was banned even before it came into existence officially. The Swami worked hard to inspire people in fighting against the Nizam rule. As the ban on state Congress was lifted in 1946, Ramananda Tirtha became its President and attracted many educated, young people to join it. He took an active role in conducting the join India movement, fought against the Razakars and the Nizam government, led the people in the Independence movement (against the Nizam) untill the state got independence. After the Hyderabad joined the Indian union, Tirtha again fought for the formation of Visalandhra. He led the ‘Bhoodhaan’ movement of Vinobha Bhave in Hyderabad, helped set up a khadi society, Harijan Service Centre, South Indian Hindi Prachar Sabha and Gram Swaraj movement. He also con¬ducted constructive activities in Maharashtra. He was elected to the Loksabha in 1951 and 1956 and distanced himself from politics in 1962. He breathed his last an 22 January 1972. Maqbool Ahmed was born on 28 May, 1902 in Punjab. As he settled in Hyderabad later, he was considered as a Hyderabadi. While studying at ori¬ental college in Aligarh, he was influenced by the National movement and joined it. He went to jail several times during that period. The Nizam Government ordered him to leave Hyderabad in 1938 for his active role in the Independence movement. He toured Kerala later and had given speeches criticising religious politics. Later Ahmed played an active part in the ‘Join India’ movement against the Nizam Government. He opposed the partition of India vehemently. Ahmed worked as a member of Hyderabad Vidhan Sabha between 1952-56 and as a Congress leader in the sabha between 1956-60. He was proficient in several languages and helped set up many social and literary organisations in Hyderabad, he worked for many newspapers like ‘Daily Saltayat, Paisa Akbar, Mujir-e-Deccan and Amar Bharat. He died on 14 July 1963. Narayana Reddy was born on 29 July 1931 at Hanumaji peta of Karimnagar district. He rendered valuable services to the Telugu literary field and is continuing to do so. He received the Jnanapith award for his book ‘Viswambhara’ in 1988 and became one of the few Andhras who had that distinction. He received his Doctorate in Telugu from Osmania University and worked as a professor there for many years. He received (and receiving) many awards and rewards during his long career. He is a scholar not only in Telugu but in Urdu also. He worked as a member of the Rajyasabha. He wrote many songs in Telugu films. He received ‘Padmasri’ in 1992. Some of his books are-‘Bhoogolamanta Manishi ‘Kalam Sakshiga’, Karpura vasantarayalu’, ‘Matti- Manishi’, ‘Parinitavani’, Viswambhara and ‘the moving spirit’. Gazals in Telugu are his speciality. Sarojini Naidu is famous not only as a poetess and singer but also as a social reformer and freedom fighter. She was born at Hyderabad on 17 February 1879. Her father was the famous Bengali scholar Dr. Aghoranath chattopadhyaya and her mother was a famous singer, Varada Sundari. Sarojini was also a beautiful singer and was called as the “Nightingale of India”. She passed her matric exam very early, in her 12th year and had written her first book ‘The lady of the lake” in just 6 days in her 13th year. She married Mutyala Govinda Raju Naidu and had become Sarojini Naidu. Some of her famous books are ‘The Golden Threshold’, The bird of Time’, ‘The broken wing, and ‘The father of women’. Her poetry had gotten high praise in England also. Sarojini was influenced by the ideals of Gandhiji and joined the National movement. She attended the Lucknow National Congress conference in 1961 and presided over the Kanchi state Congress meeting in 1918. She went to England as a member of the Home rule del-egation in 1919, she visited Kenya and South Africa between 1924-25 and America in 1928 as an ambas-sador of the Indian National Congress. She was elected as the president of the National Congress conference at Kanpur in 1925 and participated in the Salt Satyagraha with Gandhiji in 1930. She attended the second ‘All party conference’ at London in 1931. Sarojini went to jail several times during her work in the National movement. She never wanted any political power or posts. After India became independent, she was appointed as Governor of U.P. but died soon after that on 22 March 1949. ‘Social welfare of India’ magazine, published by Indian Government. Durgabai was the first presi¬dent of the National Educational council. She married the famous economist C.D. Deshmukh in 1952. She founded the ‘Andhra Mahila Sabha’ at Madras in 1939 for the welfare of women. A nursing home, women’s hostel and orthopedic centre were also set up side by side with it. She extended it to Hyderabad after the formation of Andhra pradesh, and established an industrial education centre, Sishuvihar, Women’s college, a special dispensary for the handicapped and a centre for family welfare. She dedicated her life for the upliftment of women and the backward sections of the society. She was awarded an honourary doctorate for her services by the Andhra university in 1963 and the Nehru award in 1971 and Padmavibhushan in 1975. She was called as the ‘Andhra Mahila’ by prominent persons of her day. She breathed her last on a may 1981. Hanumantha Rao awak¬ened the people of Telangana against the atrocities. Worked for the of the Nizam and Social, cultural and political develop¬ment of the region endlessly. Pitamaha’. Madapati was born on 22 January 1885 at Pokunuru village of Nandigama Taluq in Krishna district. He was brought up by his maternal uncle, Jamalapuram Venkata Rao and started working as the Mirmunshi’ in the District educational office in Hanumakonda. Later he was appointed as a sir- sadar in the Hyderabad office and there he studied Law privately. He started practicing as an advocate of Law in 1917, He was influenced by the social reform movement of Kandukuri, Library movement of Komarraju and by the speeches of Bipin Chandrapaul during the National movement. He worked as the Secretary of Sri Krishnadevaraya Andhra Bhasha Nilayam between 1914-15 and later founded the Bala Saraswati library and Vemana Andhra Bhasha nilayam in Gowliguda and Nampally in Hyderabad respectively. To awaken the literary minds in the Hyderabad state, he founded the ‘Nizam state Andhra Janasangham’ in 1923 and became its first secretary. The first meeting of the sabha was held at Jogipet of Medak district in 1930. Madapati Presided over its 4th conference at Siricilla of Karimnagar district. He founded a school for girls in Hyderabad which later on became the Andhra Girls High school (Narayanaguda). He had written many books also. Some of his famous books are – ‘Nizam Rashtra Andhrula’, ‘Vartaka Swatantryamu’, Granthalayamulu’ ‘Vettichakiri’, Nizam Rashtramlo Rajyanga Samskaranalu and others. He had became the first mayor of Hyderabad after the state joined the Indian union (1951-54). He set up a ‘Grievances committee’ to study the problem of the citizens. He was presented with ‘Padma Bhushan’ by the government of India. He worked as the Chairman of A.P.legislative council. He breathed his last on 11 November 1970. Narayana Reddy was born on 4 June, 1908 at pochampadu Village of Nalgonda district. While studying in the Nizam college he was attracted to the National movement and partici¬pated in the Salt satyagraha in 1930. He joined the Andhra Mahasabha and presided over its conferences at Chilkur in 1941 and at Bhuvanagiri in 1944 and worked for the awakening of Telangana people. He joined the Communist party in 1930. When the Andhra Mahasabha split into two factions in 1944, he led the extremist (communist) faction. He was one of the founders of the Hyderabad State Congress. In fact, he played an important role in almost each and every movement of Telangana at that period and tried to help the people in opposing the Nizam rule. He wrote a book on Telangana namely-‘Veera Telangana Naa Anubhavalu Jnapakalu’. Though Narayana reddy was born in a well-to- do family, he led a simple life. He always worried about the welfare of the down trodden of the society.He distributed 400 acres of his own land to the poor and needy of Telangana, He was the leader, of the Telangana armed struggle which fought against the atrocities of land lords and Nizam government. When the Communist party was banned by the gov¬ernment, He went underground. He also participated actively in the ‘Visalandhra’ movement. He was elected as the Nalgonda M.P. in the 1952 general elections. He founded an organisation called the ‘Telangana Martyrs memorial trust’. He died on 7 September 1991. In memory of Narayana Reddy, national level, awards are being given to an administrator, econo¬mist and social worker annually from 1991. Chattopadhyaya was a great educationist, scholar, nationalist and poet, who though a Bengali settled down in Hyderabad and served the Andhras. He was also the father of Sarojini Naidu. He was proficient in Bengali, Urdu, English, Sanskrit, Hebrew, French, German and Russian languages and was called as a ‘Walking Encyclopedia’. Chattopadhyaya had received a doctoral degree in chemistry in 1887 from the Edenburgh University and had become the first Indian scientist with a doc¬toral degree. He worked as a professor and principal in the Nizam college of Hyderabad and gave support to education of women. He joined the Brahmasamai first and later on took an active part in establishing the Aryasamaj in Hyderabad. He opposed casteism and child marriages vehemently, Chattopadhyaya, with some other leaders, started the ‘Chanda Railway Agitation’ as far back as 1883 and was arrested and expelled from Hyderabad. This agita¬tion started political awakening of the Hyderabad state. He also began the ‘Swadeshi movement’ in 1905 from his house, for the first time in the Hyderabad state. He was very courageous in opposing the Nizam even as early as 1905. Mohiyuddin was a famous poet and one of the founders of the Communist movement in the Hyderabad state. He was born at Andhol Village of Medak district on 4 february 1908 and studied M.A. in Osmania University. He started working as a lec¬turer in the city college of Hyderabad, but left his job Telangana History & Culture to join the Communist movement in 1940-41 with the strike of the labourers of Vazir sultan company. Later, he became the president of many labour welfare organisations. Mohiyuddin was a famous, poet, who tried to awaken the people of Telangana through his writings. As a Communist, he visited China, Soviet union, Eastern European, and African countries. He was a member of the National Council of Communist party. He worked for the development of the A.P. Sahitya Academy, when he was member in it. Some of his famous books are-‘Guletar and Sulkhsavera’. His poetry was translated into English, Russian, Hindi and Telugu languages. Mohiyuddin was elected as a an MLA from Huzurnagar in 1952. He was the opposition leader in the A.P- leg-islative council from 1956 to 1969. He died on 24 August 1969. Komuram Bhim was born in 1942 at Su.nkarapalli tribal village of Adilabad district. He dedicated his life to the welfare of his native tribals- Gonds, Koyas and Chenchus. He led his people against atrocities of landlords on tribals. He was influenced by the battles of Bhagat Singh, Subhash Chandra Bose and Alluri Sitaramaraju. He made the Village of Babajhari as his centre of activities. He killed a land lord called Siddique, who had been harassing his fellow Gonds at Sunkarapalli and was arrested by the Nizam Government and was hanged to death later on. His sacrifice laid the foundation stone for the Telangana armed struggle. K.V. Rangareddy, who is called as the ‘Father of Telangana’ was born on 12 December 1890 in the Mangalaram Village of Hyderabad district (now Rangareddy district). He entered the political arena of Telangana through his ‘Guru’ Madapati Hanu mantha rao. He was a representative of lawyers in the region and worked hard towards solving the numerous problems of Telangana farmers. He worked for the development of ‘Golconda Patrika’. He partici¬pated in almost all the movements of Telangana at that period, espe¬cially the Andhra Mahasabha. He later on became the first deputy chief minis¬ter of Andhra pradesh. When Hyderabad district was divided in 1977, the region surrounding the Hyderabad city was formed into a separate district and was named after him which is now called as the Rangareddy district. Shoyabullah Khan was the young Editor of an Urdu Journal called ‘Imroz’. He condemned the atrocities of the Razakars on the Hindus fearlessly and criticised Qasim Razvi for his fanaticism. He issued statements in his paper, urging the Nizam to accede to India after the Indian independence. Razvi, who was a famatic, warned Shoyabullah khan that ‘The hand that rises against the Muslim should either drop down or would be cut off. With in two days the warning was put into action when Shoyabullah Khan was shot down and his hands were cut on 21 August 1948. Thus he became a martyr and one of the bravest journalists the country had produced. Dasarathi Krishnamacharyulu was born on 22 July, 1925 at Chinagudur near Mahaboobabad of Warangal district. He graduated from the Osmania University and was a member of Communist party for some time during the farmers’ movement under the Nizam rule. He participated in several peoples’ movements under the Hyderabad state Congress. He was a great poet of Telangana. His poems condemned the Nizam rule and awakened the people of Telangana. His ‘Agnidhaara’ was a famous poem in this regard, some of his other books are ‘Rudraveena’, ‘Mahandhrodayam’, Amritabhishekam’, Maha- bodhi, Timiramto Samaram’ and ‘Kavita Pushpakam’. He criticised the atrocities of Nizam vehemently. His famous phrase – “Na Telangana Koti Ratanala Veena” – is used even today by the people of Andhra Pradesh. Dasarathi later on became a producer in the All India Radio. He had written stories, songs and screenplay for many Telugu movies. He achieved Doctorates from Agra and Venkateswara Universities and ‘Kalaprapoorna’ from Andhra University and many more awards and rewards. He founded the ‘Telangana writers Association’ and conducted a literary movement. He was proficient in Urdu and Persian languages also. His ‘Gaalib Geetalu’ book is very famous. He breathed his last on 5 November, 1987. Rangamma and Narayana reddy belonged to Itikalapadu of the Mahabubnagar district. Suravaram did his higher education in Nizam College of Hyderabad. Later he began his career as a lawyer having completed his BA and BL degrees from the portals of the Presidency College, Madras (the present day Chennai). However, the rampant illiteracy among the Telugu speaking people distressed him. His angst was further aggravated when he witnessed the gradual degradation of the Telugu language caused by the hegemony of the Urdu speaking elite. He realised the need to use his knowledge to help his mother tongue move out of this ignominy. Suravaram1 s portfolio is abundant with literary works that upholds the sanctity and purity of the Telangana Telugu language. His first endeavour to awaken a pride amongst the Telugu speaking people of Telangana for their language and history was through the publication of the Golconda Patrika in 1926. The journal was published twice a week and strived to reinstate the pop¬ularity of the Telugu language. It was also intended tp help in the development the Telangana Telugu people irrespective of tribe or caste. Several articles published in the Golconda Patrika were republished in other noted journals like Shobha, Sujata and Bharati thus ensuring a wider reach and helping spread the greater cause. During that time, there were no proof readers, sub editors, editors, etc. in Telugu language. He alone did everything – writing content, proof reading, editor work, designing, etc. He used different names like Bhava Kavi, Chitra Gupta, Verri Vengalappa, etc. for different kinds of articles in his publications. In the span of 10 years, he wrote close to 1500 articles in Telangana’s first press media ’Golconda Patrika’. Suravaram was a scholar in four languages namely, Sanskrit, Telugu, Urdu and English. However, his love for Telugu and Telangana led him to publish works primarily in that language. The Andhrula Saanghika Charitra, the social history of the Andhras was first published in 1949. It highlights the rich history and culture of the Telangana people, the origin of the various castes living within the Telangana community and their subsequent intermingling which has led to the evolvement of the rich Telugu culture. ‘The Andhrula Saanghika Charitra” earned Suravaram the Kendra Sahitya Academy Puraskaram (national book award in 1995. The popularity and relevance of the book in understand¬ing the Telugu history and culture were profound. It has been republished several times and has also been translated into Hindi by Yarlagadda Laxmi Prasad. From 1970 onwards this became the official textbook for the Andhra Pradesh Civil Services Commission as well as for the Indian Administrative Services and the Indian Police Services. Suravaram Pratapa Reddy’s most celebrated attempt at reinstating the glory of the rich Telangana Telugu literature was the publication of Golkonda Kavula Sanchika An Andhra poet Venkata Raghavachaaryulu criticised that there are no poets in Telangana region and these words made Suravaram very angry. He did a great research on finding all the poets from different villages of Telangana and made them write poems. With more than 350 poets contributions and compilations, he published the book ‘Golkonda Kavula Sanchika’ in the year 1936 and is considered a milestone in establishing the richness and versatility of Telangana Telugu literature. In this process, Suravaram also brought many Telangana poets to limelight and published their great work in his publications also. Some of his other works include ‘Nizam rash- tra Palanam, Mogalayi kathalu, Sanghoddharana, Uchchala Vishaadamu, Grandhalayamu, Hinduvula Pandugalu, Haindava Dharmaveerulu, Yuvajana Vijnanam’. Writer, poet, novelist, literary critic, social historian Suravaram Pratapa Reddy found various channels by which he could uplift the fast decaying Telangana population. His passion for his roots made him realise the need to keep nurturing them in order to foster the right environment for the proper growth and development of the future gener¬ation. He realised the deep peril of the Telugu speak¬ing population owing to the increasing dominance of the Urdu language and worked towards addressing that need. He also started ‘Andhra jana Sangham’ organisation in the year 1921. Suravaram Pratapa reddy got elected to Hyderabad Assembly from Vanaparty constituency of Mahaboobnagar district in the year 1952. Suravaram Pratapa Reddy died on 25- Aug-1953 leaving behind a. generation of conscious and proud Telanganas who are carrying forward his legacy with the same momentum. There is a statue of Suravaram pratapa Reddy on Tank Band, Secunderabad for his contribution to literature. In Jan 2012, Suravaram State is Unveiled in Mahaboobnagar town many Andhra poets birthdays were celebrated in the united AP State but never gave any importance to this literature figure of Telangana. Suravaram was first person to raise his voice for self-respect. He is the one who started press in Telangana region. His service and dedication to Telangana literature for 4 decades cannot be described in words. He treated culture as body where language is our breathe. Telangana is certainly missing the great gaint of Telangana literature. Raja Bahadaur Venkatrama of the erstwhile Asafjahi regime, had a vision of the rights con¬ferred by the Universal Declaration of Human Rights and recognised them much earlier than their enunciation, the Lokayukta B. Subhashan Reddy observed. Though serving under a monarch, he respected people’s rights to life, liberty, dignity and education, Justice Reddy noted, and lauded his efforts in aiding the education of masses. Speaking as the chief guest after inaugurating the two-day seminar on Thursday to mark the 60th death anniversary of the last Kotwal of the Nizam’s rule, he wished for the revival of ‘Golconda Patrika’ journal established by Mr.Reddy. The seminar was organised at the Potti Sreeramulu Telugu University by the Telangana Language and Cultural Council. Renowned journalist-columnist K. Srinivas said Mr. Reddy’s was the foundational effort which led to the formation of modern Telangana civil society and inspired many political movements. Mr. Reddy also convinced the Nizam about the need for community organisation among Dalits, Mr. Srinivas said. “He had been an observer of the Telangana armed struggle, and was pained by the split between nationalist and left forces. He laid the foundation for the Telangana cultural and social movements, and developed the modern middle class in this region, all the while serving a government which was consid¬ered largely alien,” Mr. Srinivas noted. He remains a model for the leaders carrying people’s mandate, and what the region requires now is a personality like him, he asserted. A compilation of poetry on late Mr. Reddy, ‘Kotwal Keerti Pathaka’ was launched by Justice Reddy on the occasion, Vice-Chancellor of the Telugu University, Elluri Siva Reddy, and journalist-colum-nist Allam Narayana also spoke. Veerabhadrarao Adiraju was one of the few people who worked very hard for the renaissance of Telugu language in Telangana when there was no respect for it during the autocratic rule of Nizam. He was born in 1890 A.D, in Dendukuru village in Madhira taluq of Khammam district in a Brahmin family. His father was Lingayya and mother was Vengamamba. He lost his father at a very young age. So, he was educated at his .^uncle Rangarao Ravichettu’s place in Hyderabad. He finished his schooling at Chadarghat High School. He was one of the few that attended the foundation function of Srikrishnadevarayaandhra Bhasha nilayam in Hyderabad, when he was still in High School, Later, he served the Bhasha nilayam as a member of the working committee and secretary. When Lakshmana rao Komarraju’s Vijnana Chandrika Mandali (Mandali) was forced to move from Hyderabad to Chennai, he moved to Chennai at the request of Lakshmana rao to work for the Mandali in 1908. While working at Mandali, he met many reputed writers, researchers and pandits. He was influenced by Lakshmana rao. Under the men¬torship of Lakshmana rao, he was trained to be a very good researcher and a responsible writer. He moved to Hyderabad in 1914 from Chennai and was appointed as a Telugu Pundit at Mahabub College. Later, he worked as a Telugu Pundit at Chadarghat High School and at Girls High School in Narayanaguda. He was a very good writer and a historian. His writings include Jeevita charitraavali, Chitaab khan charitra, praacheenaandhra nagaramu- lu, mana telangaanamu, greeku puraana kathalu, lalita kathaavali, etc. He passed away in 1973. He was one of the few who greatly helped dis¬cover many details of ancient Telugu history. He was serviced as secretary for Andhra Jana sangham in 1921. He wrote so many historical sto¬ries, ‘Greek Mythological stories’. His greatest book was Kakateeyaandhra Darsini. Chityala Ailamma or Chakali Ailamma was an Indian revolutionary leader during the Telangana Rebellion. She revolted against the feudal lord, Zamindar Ramachandra Reddy, known as Visunuru Deshmukh, to save her four acres of land when he tried to occupy it. She became an inspiration for many during the rebellion against the feudal lords of the Telangana region. Rangacharya Dasarathi born in August 24th, 1928 in a small village Warangal district in Telangana region of Hyderabad state ruled by the Nizam. From the begin¬ning, he professed a great impa¬tience with the autocratic rule of Nizam. Participated actively in the fight against the Nizam and once even was arrested and severely beaten by a police officer. He later went underground and continued their struggle. Aside from Chillara Devullu (minor deities, 1969), at least one other novel of his Modugu Poolu (Flower of Fire, 1971) has the history of Telangana during the reign of Nizam of your fund. Both novels are firmly rooted in the history of Telangana, regis-tered and unregistered. Given the feudal back¬ground and negligible literacy rate and Chillara Devullu , Modugu Poolu are two of the rarest big novels have come from Telangana. Rangacharya these novels written in the dialect of Telangana Telugu against the opinion of the tra-ditionalists. He wanted his novels to be easily under-stood by people and there was no other way to do that, except in writing in the language of the people. He did not become a novelist by accident. He want¬ed to be a novelist and carefully trained to be one. That perhaps explains why his style has a rare refinement and structure of his novels is almost per¬fect. According to an admission Rangacharya has seen life in all its nakedness and not a particular ism. He looked at the man as man, with their strengths and weaknesses. May be that’s why some of his characters in perfect condition often show signs of weakness and some of his most villains have an element of nobility and humanity lurking some where in his mental constitution. As indicated above, Chillara Devullu was writ¬ten in the context of rural life in Telangana during the last decade of the Nizam’s government. During the two hundred years or so of the rule of Asaf Jahi (Nizam) and the dynasty of the four hundred years of Muslim rule before the Telugu language and cul¬ture were very distorted and deformed in the region of Telangana. The Nizam had its representatives in all feudal villages. He died on 8 June, 2015. Golconda newspapers.Dharma Bhiksham as student boycotted silver jubilee celebrations of the then Nizam’s coronation, As a student Dharma Bhiksham Goud ran a students hostel in Suryapet, which was a training centre for students to inculcate patriotism and also to fight against the social evils of those days.Dharma Biksham Goud was an active member in rebellion that took place in Telangana, against the Nizam of Hyderabad for which he was imprisoned for more than five years. Dharma Biksham was named as most dangerous political prisoner, was imprisoned alone in dark cell and in to various jails like Nalgonda, Chenchalguda, Aurangabad, Jalna etc. Dharma Biksham was the convener of the jail inmates and organised strike in prisons demanding rights for prisoners. Dharma Bhiksham victories in the elec¬tions are historical. In 1952, first general elec¬tions to Hyderabad State Assembly, he got the highest majority. In 1957, he elected to from Nakrekal constituency and in 1962, elected from Nalgonda to Andhra Pradesh Assembly. Dharma Bhiksham achieved a rare feat of hat trick victories from three different constituencies consec¬utively. Also, he is one of the very few, who got elect¬ed to two state assemblies, i.e., Hyderabad State(1952), Andhra Pradesh(1957 & 1962). In 1991, Dharma Bhiksham was the only M.P representing CPI from South India. In 1996 he won the election by defeating 480 contestants with a margin well above 76,000 votes. This huge number of contestants in the fray are not against the Bhiksham, but contested by the call given by Jala Sadhana Samithi to draw the attention of nation on the neglect attitude of the Government towards Nalgonda district, which was suffering with heavy, fluoride. This election brought the change in the election system in India by enhancing the nomina¬tion deposit amount drastically to avoid number of non serious contestants. Dharma Bhiksham was the only M.P. got elected twice consecutively from Nalgonda parliamentary constituency. Dharma Bhiksham is well known for upliftment of toddy tappers community. He organised toddy tappers under A.P. Geeta Panivaarala sangham, which is a premier and first union for toddy tappers with more than 50 years of history. He advocated for upgrading the toddy tapping profession scientifical¬ly and also to develop it as a rural industry by mak¬ing sugar, jaggery, chocolates, and cool drinks etc. from toddy. He is the instrumental for achieving ex- gratia to the toddy tappers, who fell from toddy palm trees while tapping. He helped in the formation of co-operative societies for toddy tappers. For this he was specially felicitate on the occasion of hundred years of Co-operative movement by the’ then chief minister Y.S.Rajasekhar Reddy. He died on 26 March, 2011. Kothapalli Jayashankar popularly known as ‘Professor Jayashankar’ (6 August, 1934 – 21 June, 2011) was an Indian academic and Social Activist. He was the ideologue of Telangana Movement. He has been fighting for a separate state since 1952.He often stated that unequal distribution of river water was the root cause of separate Telangana movement. He was the former Vice¬Chancellor of Kakatiya University and an activist in the Separate Telangana Movement. Prof. Jayashankar Telangana State Agricultural University (PJTSAU) named in honour and memory of Professor Jayashankar, is the only Farm University of Telangana state which came into being in the event of the bifurcation from Acharya N.G. Ranga Agricultural University. K. Jayashankar was born in Akkampet village, Atmakur mandal, Warangal in erstwhile Hyderabad state to Lakshmikantha Rao and Mahalakshmi of the Vishwakarma community. He did his schooling in Hanumakonda, Warangal and his M.A. in Economics at Banaras Hindu University, M.A. in Economics at Aligarh University and Ph.D in Economics at Osmania University, and BEd at Osmania University. During the Nizam rule in Hyderabad state, it was mandatory for all schools to sing a song praising the Nizam, when the headmaster of the Markaji High School in Hanumakonda asked his students to sing the song, K. Jayashankar, then a Class VI stu¬dent, defied the rule and sang Vandemataram. His biography “Voduvani Muchchata” written by Kompelli Venkat Goud was released by KCR and other prominent personalities. As a young student of intermediate, he walked out of his class in protest against state Re-organisation in 1952. He also start¬ed in a bus to participate in 1952 Mulki Agitation. Then, in 1962, he was part of a campaign which rocked the region. He joined the movement for a sep¬arate Telangana state in 1952, when he was a stu¬dent leader. As a lecturer, in 1968, he participated in the revived the agitation. He carried out his struggle for Telangana through research and academic studies, and by educating people on the cause. He is known as the original Telangana ideologue. He led several agitations since 1962, transforming into a mass movement after 1969 agitation. He was associated with the Telangana move¬ment efforts to obtain statehood for Telangana since 1952, stating with Non-Mulki go back and Idli Sambar go back movement. In 1969 Jayashankar formed a team with ten members to fight for Telangana. He was the only survivor while the oth¬ers were killed in police firing. He then started ‘Telangana Janasabha”. It was banned by the Indian government. He authored a large number of articles and research papers, in English and Telugu, on various aspects of the Telangana Problem. He was instrumental in forming the Telangana Development Forum (TDF, USA) in 1999. He was invited by the American Telugu Association (ATA) USA, to speak about the Problems of regional dis-parities in Andhra Pradesh in July 2000 and July 2002. He was invited by the Telangana Development Forum (TDF) USA to give a series of lectures on var-ious facets of the Telangana Movement in ten major cities of the United States during July/August 2000. At the time of his death, he was the Chairman of Centre for Telangana Studies which is engaged in research and publication relating to problems of Telangana. He is the founder member of Telangana Aikya Vedika and was on its Executive Committee. It was Jayashankar who offered lime juice to the TRS president when the latter broke his famous fast for Telangana in December 2009.Professor Jayashankar was The Registrar of the then Central Institute of English and Foreign Languages (CIEFL) before being appointed Vice-chancellor of Kakatiya University in 1991. (i) Taught Economics and supervised research at Doctoral Level. (ii) Made in-depth studies on the problems ema-nating from regional disparities in the levels of development with special reference to A.P. (iii) Has to his credit a large number of papers published in the areas of Economic Development and Educational Economics. The Telangana Government provides Padma bhushan soon.He died on 21 June, 2011 at 11.15 AM after battling stomach cancer. He did not marry and remained a bachelor throughout all his life. Muddasani Kodanda Rama Reddy known as M. Kodandaram is an educator and political activist. He is also the chairman of all¬party Telangana Political Joint Action Committee (T- JAC), which is formed for fighting for separate Telangana state. He is a professor in Political Science from Osmania University.Kodandaram was born to M. Janardhan Reddy, a farmer from Manchiryal in Adilabad district. He did his major part of education in Warangal. After completing his degree from Warangal government college, he joined Osmania University in 1975 to pursue his post-graduation in political science. He completed his M. Phil in politi¬cal science in 1980 at Jawaharlal Nehru University, Delhi. M. Kodandaram in 1980 joined Hyderabad Central University as a research scholar. After a few months, he returned to Osmania University to join as a lecturer in political science. He obtained his doc¬torate from Osmania University in 2003. He worked as a civil liberties activist in the 1980s. From 1996, he started organising seminars on the Telangana issue and after joining Telangana Vidya Vanthula Vedika, was elected its president in 2003. He is also an activist on Polavaram displacement issues in the Godavari districts of Andhra Pradesh, India. He started teaching in Osmania University Post Graduate College at Secunderabad and this is the last year of his service. He has been working as TJAC chairman, which played an active role in Telangana formation world peace festival Award 2014 (Shanti Dootha Award). Kalvakuntla Chandrashekhar Rao (KCR) is an Indian politician and the first Chief Minister of Telangana state. He is also the founder of the Telangana Rashtra Samithi (TRS) party formed for the cause of a separate state of Telangana. He has been the Member of the Legislative Assembly (MLA) from different constituencies. He has also been a Member of Parliament and has also held the position of a Cabinet Minister for Labour and Employment. KCR played an important role in the formation of a separate Telangana state. Besides forming a separate political party, he also spear¬headed the movement demanding a separate state. He began a fast-unto-death strike, just a few months after the death of YS Reddy, the then CM of Andhra Pradesh, on November 29th, 2009. The strike ended 11 days later on December 9, 2009 when the Government of India declared the process for formation of the state of Telangana. He has also served as a Member of Parliament from Mahabubnagar constituency from 2009 to 2014. On 2 June 2014, he sworn in as the first Chief Minister of Telangana. Important positions held: He is the first Chief Minister of the new state of Telangana and the president of the Telangana Rashtra Samithi (TRS), a Regional Party in India. He is a Member of the Legislative Assembly from the Gajwel constituency of Medak District, Telangana. He was the cabinet Minister for Labour and Employment. He was a member of the Telugu Desam Party and served as Deputy Speaker until he resigned from the party. Achievements: Rao began a hunger strike on November 29, 2009, demanding a separate Telangana state. Eleven days later, on December 9, 2009, the Indian government announced that the “process of formation of the state of Telangana would be initiated”. Tanguturi Anjaiah was born in Hyderabad. Anjaiah rose from a being worker at Hyderabad Aalwyn Limited in Hyderabad to become a trade union leader and later Union Labour Minister. As the Chief Minister of Andhra Pradesh, he was known for his accommodat¬ing politics; his ministery was 72 member strong and the biggest in the history of Andhra Pradesh. Lumbini Park in Hyderabad was renamed as Anjaiah Lumbini park on his memory in 2006. Anjaiah was married to T. Manemma. She served as a Secunderabad MP and as the Member of the Legislative Assembly for Musheerabad. They have a son name T.Srinivas Reddy and four daughters. He died on 27 November, 1989. He was among the distinguished freedom fight¬ers facilitated during the Congress Foundation Day celebrations last month. Chairman of the Gandhi Bhavan Trust, he worked in Wardha Ashram during the Independence movement and authored the book ‘Bapu-Nenu’ detailing his experiences there. A veteran of Vandemataram, Quit India and Hyderabad Liberation movements, Rajalingam was a Gandhian to the core which was evident from his contribution to the Khadi institutions as chairman of the Hyderabad Khadi Samiti. He worked as a Minister in the Burgula Ramakrishna Rao Cabinet for two years in the erst-while Hyderabad State and served the State in various capacities. He rendered yeoman services for the develop¬ment of WTarangal district which he represented in the Assembly. He died on 24 january,2012. Vattikota Alwar Swamy (1915-1961) was a Telugu writer, human rights activist, communist leader, journalist and publisher. He was born in Madaram kalan(shaligouraram mandal) village of Nalgonda district on November 1, 1915. His parents were Machavaram Simhadramma and Ramachandra Charyulu. As his father died when he was young, he completed his education while working as cook for his teacher Seetharama Rao. . He was active in the library movement and the communist movement, and he fought against Nizam government. His activities angered Nizam and he was jailed. His book about his experience in Vattikota jail, Jailu Lopala (Inside Jail), was pub¬lished. His other works include novels Prajala Manishi (People’s Man) (1952) and Gangu (1940-45). He was also president of the Nalgonda district unit of Andhra Mahasabha for some time. To inspire and educate Telangana, he established Deshoddaraka Granthamala and published 35 books. He also published a newspaper called Telangana. He died on February 5, 1961. 1919 in Siripuram village (presently in Moinabad man- dal), Asraf-i-Balda, Hyderabad State. He took his MBBS degree in 1941. He was the founder of Andhra Yuvajana Samiti and Students Congress, with several student, youth, social, educational, lit¬erary and cultural organisations, He edited a week¬ly for about two years and contributed articles to leading dailies and Journals In the case of Jai Telangana movement, once Congress Union Steel Minister, Marri Chenna Reddy hijacked the Telangana Praja Samiti (TPS) movement of students and employees of Telangana region of Andhra Pradesh and led it to its successful end. Chenna Reddy replaced its first president A.Madanmohan so as to politicalise the movement. Accordingly, this movement-turned party, that secured the popular mandate in terms of winning 11 Loksabha seats (out of 14 seats), swimming across all the currents against the entrenched Congress and the Communists, from the region. Failed to take on the Durga-Indira Gandhi, the Chenna reddy leadership had to yield to the pressures and favours of the Prime Minister. Thus he had to surrender all the TPS’s MPs to Indira Gandhi for few crumbs and there by sabotaged the movement once for all. However, there was not much noise raised against the act of betrayal, from any quarter including the followers of the TPS. What is discernible from this instance is that the leadership is like a doubie-edged sword, which can ensure success of a movement, or else it can water down the movements as and when they choose to do so. Thus, the leadership is very crucial in any democratic movement. Although the Telangana movement has always been a democratic one, as the popular mandate was recorded on couple of occasions, the leadership played a dubious role. Unless the leaders are exemplary, one cannot expect them to perform better. He took active part in the political struggle in the erstwhile Hyderabad State and in 1942 was the General Secretary of Andhra Mahasabha (which was a precursor of the State Congress). In 1946, he became a member of the Standing Committee of the State Congress and General Secretary of Hyderabad City Congress. He was one of the founders and as well General Secretary of the Ideological KM.P.Group in the Congress. He was General Secretary of the Andhra Provincial Congress Committee for several years and a member of the P.C.C Working Committee for 30 years. He sworn in as chief minister of Andhra Pradesh in 1978 and 1989. He also worked as a Governor of Uttar Pradesh and Rajasthan. Narayan Rao Pawar (1925¬12 December, 2010) was an Indian independence activist and member of Arya Samaj. He became popular after plotting to kill the Last Nizam of Hyderabad, Mir Osman Ali Khan. The Bhagat Singh of Telangana Liberation Struggle, an Arya Samaj activist, Sri Narayan Rao Pawar, Who threw Bomb on fanatic Nizam convoy has passed away last night . He was of 84 years. He came into light when he dared the Nizam Army and threw bomb at Nizam’s car. Nizam escaped from the attempt, eventually Sri Narayan pawar was arrested and sentenced to Death. He was released when Nizam was dethroned and HYD state merged with India. Sanghem Laxmi Bai B.A. (27 July, 1911-2 June, 1979) is an Indian social worker and Parliamentarian. She was born at Ghatkesar, Telangana in 1911. Her father was D.Ramaiah. She was educated at Karvey University, Sharada Niketan and College of Arts, Madras. She was a full¬time social and public worker. She entered politics by boycotting Simon Commission during student life. She took active part in Salt Satyagraha and imprisoned for one year in 1930-31. At that time period she was written a book ‘Naa Jailu Gnapakalu Anubhavalu’. She was founder-member and Honourary secretary, Indira Seva Sadan (Orphanage), Radhika Maternity Home, Vasu Shishu Vihar and Masetti Hanumanthu Gupta High School in Hyderabad. She was elected to the Hyderabad State Legislative Assembly in 1952. She held the position of Deputy Minister of Education in Government of Andhra Pradesh from February, 1954 to October, 1956. She was elected to the 2nd Lok Sabha in 1957 and 3rd Lok Sabha in 1962. She got elected for 4th Lok Sabha in 1967, as a member of Indian National Congress from Medak constituency. Bhagya Reddy Varma or Madari Bhagaiah (May 22, 1888-July 2, 1950) was an Indian leader of the Adi Hindu Movement. He was known as the “Father of Dalit Movement in Andhra Pradesh”. Bhagya Reddy Varma founded around 26 schools in around Hyderabad region for dalits. He established Dalit panchayat courts to settle disputes among dalits. He chaired All India conference of Schedules castes held at Lucknow on 27, 28 December 1930, to support send delegation to Round Table conference. Babasaheb Ambedkar was present in this meeting. In 1906, he started ‘Jagan Mitra Mandali’ to educate dalits through popular folklore Bhagyareddy had launched a movement against devadasi pratha, forcing the Nizam to declare it a crime. Andhra Pradesh, India. Died Dec. 23, 2004, New Delhi), leader of the Congress (I) Party and prime minister of India from 1991 to 1996. Rao studied at Osmania University in Hyderabad and at Bombay and Nagpur Universities, eventually receiving a law degree from the latter institution. He entered politics as a Congress Party activist working for independence from Britain . He served in the Andhra Pradesh leg¬islative assembly from 1957 to 1977, supporting Indira Gandhi in her split from the Congress Party organisation in 1969. He held various ministerial positions in the Andhra Pradesh government from 1962 to 1973, including that of chief minister, or gov¬ernor, from 1971. In this latter post he implemented a revolutionary land-reform policy and secured polit¬ical participation for the lower castes. He was elect¬ed to represent Andhra Pradesh districts in the Lok Sabha (lower house of parliament) in 1972 and, under Gandhi and her son and successor, Rajiv Gandhi, served in various ministries, notably as for-eign minister (1980-84, 1988-89). Besides his politi¬cal career, Rao was known as a distinguished schol¬ar-intellectual who once was chairman of the Telugu Academy in Andhra Pradesh (1968-74). He was fluent in six languages, translated Hindi verses and books, and wrote fiction in Hindi, Marathi, and Telugu. After Rajiv Gandhi’s assassination in May 1991, the Congress (I) Party chose Rao as its leader, and he became India’s ninth prime minister after the general elections held in June. Rao almost immediately began efforts to restructure India’s economy by converting the inefficient quasi-socialist structure left by Jawaharlal Nehru and the Gandhi into a free-market system. His programme involved cutting government regulations and red tape, aban¬doning subsidies and fixed prices, and privatising state-run industries. These efforts to liberalise the economy spurred industrial growth and foreign investment, but they also resulted in rising budget and trade deficits and heightened inflation. During Rao’s tenure, Hindu fundamentalism became a sig¬nificant force in national politics for the first time, as manifested in the growing electoral strength of the Bharatiya Janata Party and other right-wing political groupings. In 1992 Hindu nationalists destroyed a mosque, leading to sectarian violence between Hindus and Muslims that persisted throughout Rao’s presidency. Corruption scandals rocked the Congress (I) Party, which continued its long decline in popularity and lost control of several major state governments to opposition parties in 1995. Rao stepped down as prime minister in May 1996 after the Congress (I) Party was soundly defeated in parliamentary elections in which it gernered an all-time low share of the popular vote. Rao resigned as party chief that September, and the following year he was charged with corruption and bribery in an alleged vote-buying scheme dating from 1993. Rao, the first Indian prime minister (in or out of office) to face trial on criminal charges, was found guilty in 2000, but his conviction was later overturned. 1967 to May 3, 1969. He was the third President of independent India. However, it is ‘ not only his career in the President’s office which makes him one of the greatest heroes that India has seen. Dr. Zakir Hussain was one of the biggest exponents of education in India and it was under his leadership that the National Muslim University was founded. Till today, the National Muslim University exists under the name of Jamia Milia Islamia, a Central University in New Delhi, and continues to flourish, producing some of the best students each year. Dr Zakir Hussain had served as the Governor of Bihar and had also taken oath as the Vice President of the country before ending his political career as the third President of India. Gaddar (born as and also known as Gummadi Vittal Rao) (born 1949) is a pseudo¬nym of a revolutionary Telugu balladeer and vocal Naxalite activist from the state of Andhra Pradesh, India. The name Gaddar was adopted as a tribute to the pre-independence Gadar party which opposed British colonial rule in Punjab during 1910s. Due to a spelling error, Gadar became Gaddar. And the name stuck. Gaddar in a meeting in Nizam College Grounds- 2005. This song, written in about 1971, became a mas-sive hit, specifically amongst rickshaw drivers. Then Gaddar came regularly to the Sunday meets. Numerous songs were written, mostly by Vittal. They printed their first songbook. It was entitled “GADDAR”; after the famous Gadar Party of Punjab. Soon, whenever they went to perform on streets, the people began to say that the “Gaddar people have come”. The name stuck, and from then on Vittalrao is known as Gaddar. Meanwhile Gaddar came to know that B Narsinga Rao was linked to the Communist Party of India (Marxist-Leninist). Slowly Gaddar also came close to the Party. Recently he wrote famous. songs ‘Podustunna Poddu meedha’ in Jaibolo Telangana film & Amma Telangana Akali Kekala Rajyam” were well known popular his songs. Ramaiah was born in Gudur village of Warangal district in Telangana to Narasamma and Ananthara- maiah in Brahmin Family. His father died when he was only 14. He studied at his village school until the third grade, with his mother’s insistence to pursue his education,. He obtained his bachelors degree at Osmania University and went on to do his M.Sc. Chukka Ramaiah fought the feudal system in Hyderabad State that was prevalent in rural hinterland of Telangana region. He actively participated in helping the poor, and was banished by his Brahmin community for helping the dalits and the downtrod-den. He joined the Mahatma Gandhi’s untouch- ability movement and tried to reform back¬ward sections in his village. He actively par¬ticipated in the rebellion against the Nizam, Razakar Movement and was jailed for several years. Chukka Ramaiah, after retiring in 1983, could not get his pension and other benefits approved by the government. This made him to look for means for livelihood. He went to Basar’s Saraswati temple and stayed there for a week to contemplate his future. There he decided to start teaching again privately. He owes much of his suc¬cess in his post-retirement life to Basar saraswati temple. He moved to Hyderabad and settled in Nallakunta. Some students who were appearing for the IIT JEE entrance exam asked his help in math¬ematics. That batch was very successful in clearing the test. He became very popular and now an entrance exam is conducted for admission into the institute, Ramaiah Institute, which is called as Entrance exam for the entrance exam and over 20,000 students take the exam and the intake is 175 for every batch. Over 2,000 students got into IITs since its launching in 1985. Chukka Ramaiah won as MLC in 2007. Chukka Ramaiah authored over 16 books in Telugu mainly focusing on education like Chinna Paatam, Desadesallo Vidya etc.